Have we moved to fixed fees by stealth? For as long as anyone in the industry can remember we talk about fees in terms of percentage of rent. It is more common to talk about fees in terms of percentages than it is in terms of dollars. When you think about it, it is kind of odd that we do that. So, at Ailo, we looked at this. We analysed all our property data (almost 200,000 managements) and grouped them by postcode, then by state. 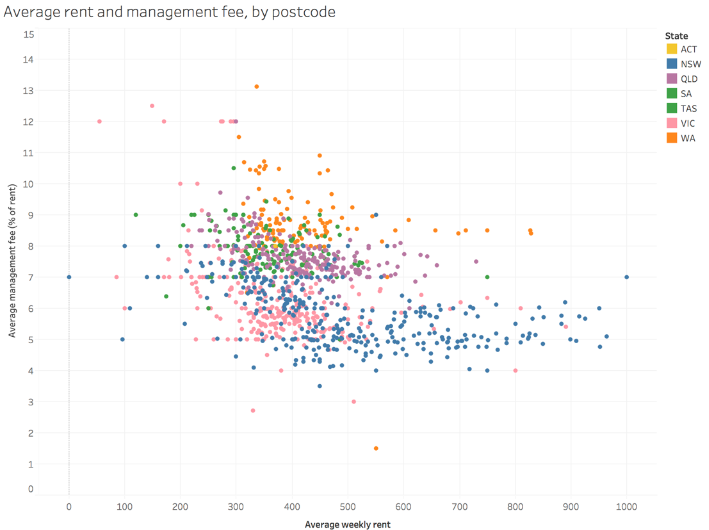 Each dot is a postcode, showing the average rent in that postcode and the average percentage of rent fees for that postcode. Each colour represents a different state. There are around 600 postcodes we have sufficient data for. On first glance, the results are striking. WA has the highest fees, NSW and Victoria the lowest. Queensland is in the middle. What do agents in WA know that people in Victoria don’t? Surely, if we could work out how they negotiate fees and learn from them, we could all raise fees and be healthier for it? Well, there’s another way to look at it. It turns out if you convert fees to an actual dollar number, these differences disappear. In 75% of postcodes, the actual dollar fees earned per property is $30 per week, or $1500 per year, with a narrow band of $7 each way accounting for the vast majority of properties. Sure, there are differences, but not related to any particular market. What do we learn from this? The first thing is to agree the conversations we have about fees as a percentage of rent is misleading. We should be talking about revenue in dollar terms. That is how we need to think about the value we create and is how our clients experience the service. On another note, the fees generated on rent collection is not the whole story. In the most profitable businesses, that fee represents less than 75% of total revenue. In the least profitable businesses, the fee represents over 90% of total revenue. The truth is we have already moved to a fixed fee model, we just don’t want to admit it. The key to revenue is you have to design fees to be aligned to the services you offer. Just thinking about fees as a percentage of rent misses all the colour that is the key to defining the value equation for the experience and services you offer. Think beyond the ‘percentage of rent’ mentality and work on defining the value you create and the experience you offer. That is the start of revenue growth. Stay updated with Ailo by signing up for our newsletter.